Scooper - Technology News: As the ATM turns 50 are we withdrawing from cash altogether? As the ATM turns 50 are we withdrawing from cash altogether? On the 27th June 1967, a British TV star, Reg Varney, became the first person in the world to use a cash machine at a branch of Barclays bank in London. With over three million ATMs now dispensing cash around the world, it is hard to imagine the novelty of that first withdrawal and how revolutionary it must have felt. The machines have gone on to become something most people take for granted. In 2015, there were nearly 3 billion withdrawals in the UK alone. On average £7,576 was taken out per day per cash machine in the UK, an increase of about £100 on 2014. But while the number of machines has continued to rise, and increasing numbers of people are using them, they are doing so less often. Alongside this, the number of cash transactions is in the decline as other ways of paying such as contactless card and mobile payments become more popular. After all, why poke around your purse to find your last few pennies when you can just wave your card or mobile phone? That said, mobile phone payments may only be the first of many steps en route to the cashless society. The World Payments Report 2016, from Cap Gemini and BNP Paribas, estimates that cashless transaction volumes grew by 10% to 426.3 billion globally in 2015. The US is responsible for just under a third of these transactions, followed by Europe and Asia. 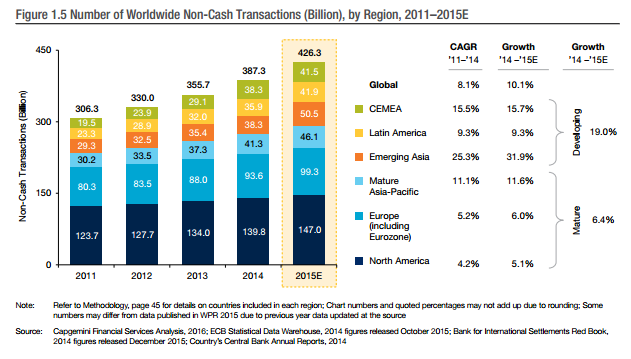 For now, card payments still account for the highest share of non-cash payments. Debit cards are the leading non-cash payment method, while credit card transaction volumes have been growing at a slightly slower pace. For one thing, people are increasingly tapping to pay. According to the Smart Payments Association , Visa and Mastercard each reported around one billion contactless transactions made by its cardholders across Europe in 2015/16, taking contactless payments to over two billion. Eastern Europe has a particular appetite for contactless transactions, as does Spain, and the UK has emerged as one of the most contactless-ready countries in the world. At the same time, one third of retail banking customers globally now use mobile devices for banking and payments at least once a week. Apple Pay and Android Pay from Google have made this even easier. They have also added another security layer with fingerprint authentication and authorization. Adding to near-field communications (NFC) payments are new technologies such as Bluetooth beacons , which will also enable contactless payments via your mobile phone. Taking a broader approach, mobile wallets – like the ‘Wallet’ app on Apple’s iPhones – can hold credit cards as well as electronic event tickets, boarding passes, electronic gift cards and loyalty cards. Technology that recognizes the veins in the palm of your hand is another method of payment that is gaining traction, and is already in use at ATMs in Asia and other parts of the world. In 2014, a Swedish university spin-out, Quixter , created a palm-scanning system to enable paying without the need to have a payment card or NFC phone on your person. Quixter said at the time that it has 4,000 users and has processed 250,000 payments. 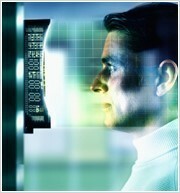 More recently, NEC and Sumitomi Bank have been trialing payments in Japan using facial recognition . NEC’s biometric recognition technology enables users to pay bills at retailers, restaurants and anywhere else your card would normally work. The technology works by matching images taken by cameras installed at the retail outlet or restaurant with pre-registered facial images. The move to a cashless society appears unavoidable, although some countries are keener on making it happen than others. In India, the government recently banned 500 and 1,000 rupee notes in an abrupt move to reduce fraud and push ahead with Prime Minister Modi’s vision of a cashless society. The Guardian reported long queues forming outside Indian banks as people scramble to exchange their high-value banknotes. The resulting cash crisis has impacted on the country’s millions of small traders as people save up precious banknotes.